Thanks to the peculiarities of our interconnected world, I feel like we spend a lot of time talking about whether little girls should sing Puccini arias on television... Some call this child abuse, akin to encouraging an eight year old to lift heavy weights without training. Others find that hyperbolic, either because they find something about the purity and innocence of a child’s voice compelling, or because they cannot hear the underlying technical imbalance. And after all, it's just singing, right? How could it possibly matter. If only a small group of children were impacted by this, perhaps voice professionals would not sound the alarm. However, the child Pop-era Star phenomenon is just the most visible symptom of a system of voice education that harms students of every age and level of ambition. Why doesn’t anyone notice this? Whether the public lacks judgement or simply good information, the underlying disconnect calls for a sustained public awareness campaign. The way I think through the argument is purely economic; that damaging a voice limits future earning potential. The average voice student will not have a full-time, life long career as a singer. However, she could be a trial lawyer, voice over artist, classroom teacher, preacher, politician, therapist, coach, or any other from the long list of professions that require voice use. Could she recover her voice with proper therapy? Probably. However, this adds the cost of therapy and deducts the lost income for her period of rehabilitation. Consider the real world example of a singer allowed to complete a music degree with something as pervasive as unresolved muscle tension dysphonia. If her teacher sends her to a therapist during the degree, this student may be able to manage her challenges in a way that keeps her on track with her colleagues. If not, she may habituate years of poor coordination, and have to rebuild her technique after graduating. I have seen students forced to take more than a year off to fix problems made worse by a lack of timely care. I have seen students give up on singing entirely because of this. So once again, the economics suggest that real harm can be done. As terrible as the handful of examples we see each year on television are, right now the larger issue is that voice teachers are unregulated. I am not sure that one could ever regulate the artistic and aesthetic aspects of voice teaching. Or even the process of training. There are too many workable approaches to dictate how to teach. However, currently anyone can claim to be qualified to address any singing voice issue, regardless of whether medical intervention is warranted. 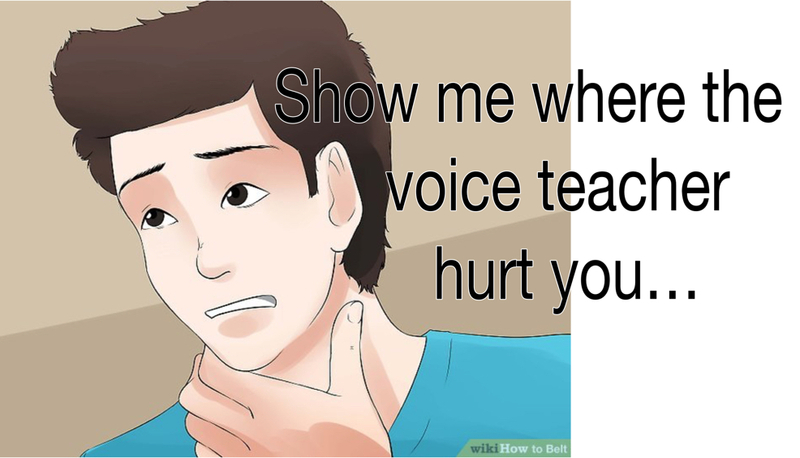 There is no enforceable requirement to refer to a voice care team for an evaluation, and no liability assumed by the voice teacher if training leads to an injury. We can begin to address this.